Looking to book a walking holiday soon? From walking in Italy to a walking holiday in Scotland, we have you covered. If you are still struggling to decide where to go on your next walking holiday then keep reading as we have some top questions to consider before booking your next walking holiday. Should you go somewhere new or should you go back to somewhere you have been before? We have some guests who go back to the same country over and over, while others prefer to go on a walking holiday in a new destination every time. If you are still looking for help then why not give us a call or send us an email and we will try our best to give you advice on where may be best to go. First think about if you have set dates to work with or are you flexible? Some countries are better than others depending on the time of year you plan on walking in. It can be pretty dangerous to walk in heat, which is why in some countries you can’t book during July and August. Safety should always comes first when thinking about a walking holiday. If you don’t mind cooler temperatures, then a walking holiday that is available off season could be a better choice. 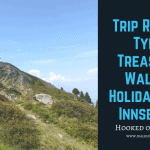 What level walking holiday to choose? Have you been on a walking holiday before? If not, then consider a level 1 or 2 walking holiday. If you are more experienced, then a 2+ holiday can be a great choice. Check out our tour selector so you can see what levels we have on offer in each country. We also have dedicated grading pages for easy walking holidays, easy to moderate waking holidays, moderate walking holidays and finally challenging walking holidays. Why not read our blog post about how fit do you need to be for a walking holiday for some extra information. At Hooked on Walking we have a huge range of self guided walking holidays available in over 10 destinations. Our guests love our self guided walking tours which is why we have plenty to choose from. However, we do offer some guided walking holidays. These are great if you are looking to have the security of a local guide who knows the routes and region and they will guide you along the route each day. You can also meet like minded walkers who love to get out in the great outdoors. We find these are the most important questions to be thinking about when looking to book your walking holiday. If you are looking for further information regarding any of our tours, then just get in touch.